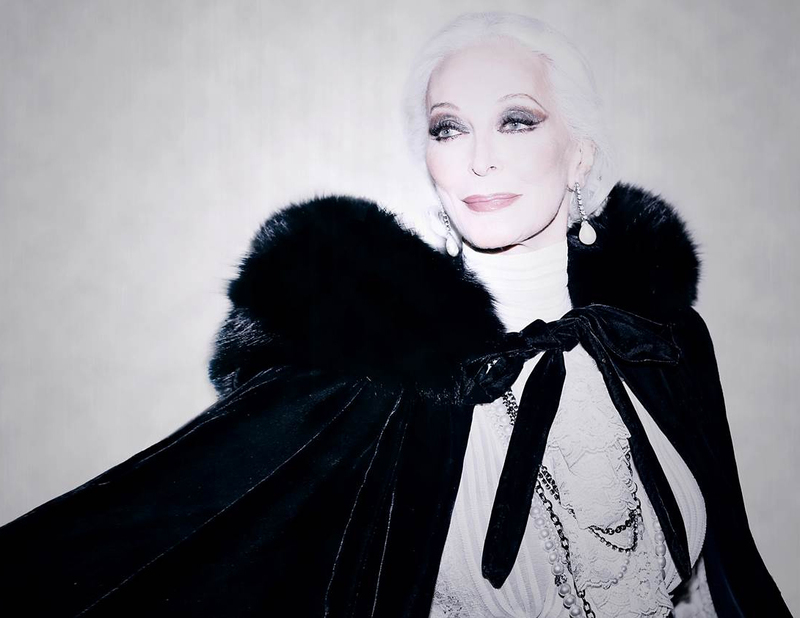 Carmen Dell’Orefice has had an incredible career as a fashion industry icon. Known as the longest working model in the industry –she’s even been noted to have the longest career as a catwalk model in the Guinness Book of World Records. During her 70-year career, she’s graced the cover of Vogue, walked the runways of all of the best names in the business during fashion weeks from Paris to New York, and now has a fashion doll representing her stunning beauty. “I think it IS a big deal that we are creating a doll in the likeness of a mature woman. Historically, our dolls, like models, are more youthful. But Carmen endures in an industry that thrives upon youth, and that says a lot about her presence on camera and on the runway. And it’s time to celebrate beauty at all ages,” said Robert Tonner, company CEO and world famous doll artist. We had the chance to catch up with Dell’Orefice during a launch party near Chicago to learn more about her iconic doll collection, her most memorable career moments, and how she will spend her birthday when she turns 83 this June. Tell us about The Carmen Dell’Orefice Collection. What was your first reaction to having a doll!? Carmen Dell’Orefice: I wish my mother were here now because I would finally be a success in her eyes. My mother was a great seamstress, that’s where I learned to sew and I used to make dolls myself when I was a campfire girl. I was totally thrilled about the idea! This is the background of my interest and my delight. Very few things make me feel honored or flattered because I’m doing a job. But this for some reason blew me away with delight, that somebody professional in an area I once aspired, signaled me out to make a doll in my image. That to me is something beyond description, other than I wish my mother were here now (laughs)! You are absolutely stunning and known as the oldest working model in the industry, what are some of your most memorable career moments? The first day I ever worked in 1945, the pictures came out in the spring of 1946, but World War II had just ended, you see, in the summer of ’45, so that was a thrill that I did something that pleased an adult. It was very difficult to please my mother. I was not spoiled! In a 70 year career, this is an impossible task to pick out because every time somebody books me, of course, I’d say, wow, I must be doing something right! And then If the same person books me twice or thrice– it’s exhilarating, that begins to be a real dialogue called a rapport. It’s like doing the tango, you know, it’s the movement. The only thing is in my profession we’re both working towards the product which is the photograph, which is my specialty. Everyone says now I’m the longest lived catwalk model. That’s not so. That’s not a fact. I do runway. I’ve shown clothes back in the 40s. They weren’t called catwalk and models weren’t degraded as badly as I feel they are today. We were ladies. There was respect –and respect for the clothes. We had those clothes so that Monday night at the opera we could dress in respect to the great artistry that we were experiencing. The world has changed. It’s just different. I feel an imminent change because people have to live in their economic reality so society will sort out fashion and give fashion a big kick in the pants and put it where it belongs as a service to the people. What’s wonderful about America is that they showed a lot of the world about manufacturing –and making pieces, separates, sportswear, that could be affordable if you had the taste. The history of fashion magazines and advertising plays the most important part. It is showing everybody how to assemble, what to eliminate and how to put together what’s right for their body type –including men. Men need to be tweaked now because they’ve gone off being silly. They can’t be comfortable in a lot that I’m looking at, that’s ugly or unattractive. Women think about men the same way that men think about women. We’re looking for each other (laughs)! At age 15 in 1946, you started working with Vogue for $7.50 an hour. After getting your first check, what was your first purchase? My mother took the check and cashed it at the local grocery store on the corner of 3rd Avenue and 54th Street and we went up 3rd Avenue to 60th Street and got our Singer sewing machine out of hock. We did that monthly to make the ends meet to make rent. You have been photographed by so many great photographers. Do you have a favorite image? Because I’m in Illinois — I realize I’m not in Chicago, somebody informed me of that, it is the photographer that lives in Chicago who took one of my favorite pictures. I don’t have many because I’m not a maven of my own photographs. I am a good art director and I look at the things objectively and am always editing. In 70 years, I have six images that stop me and I say, “Did I look like that? God I’m so glad I looked like that,” and it was Victor Skrebenski. With all honesty, it was just a fabulous front on head, black and white image, since I’m from the black and white era. Describe the perfect day for when you turn 83 this June. I finally have arranged to give myself exactly what I want –solitude. My 80th birthday was…it takes a lot of energy to help people celebrate me and their greatest present to me is…not (laughs). I said I’ll do 85, 90 and after 90, we’ll negotiate. The next one I’m willing to do 100, and after 100 I’ll do every year. Where is your favorite destination and what do you love about it? Well, probably my food emporium on 3rd Avenue and 68th Street because it’s still there and I know the days the fresh fruits and vegetables come in, it doesn’t disappoint me and it’s in walking distance, even when I’m wounded (laughs). My mother and my father– it’s genetic. Then I’m a good care-taker. I keep referring to myself as a Rolls-Royce. You know, if you put a car up on wheels to preserve it and don’t you, in stillness it rusts and when you go to use it, it doesn’t go. A body in motion tends to stay in motion and we’re meant to be in motion and everybody has a different rhythm. Any other thoughts about this collaboration? What I was really amazed to find out, after the sheer delight of being the object of the Tonner Doll Company, that there were so many adults that collect images of people they admire or that they want to emulate for one reason or another. What I hope for with the Carmen doll is that people will be interested in the seasonal choices year after year of the different outfits. I was so pleased. Mr. Tonner, a self-made man and a self-made boutique operation made me feel really comfortable, unlike some of these bigger companies that are very impersonal. I love this because we are going to have my different hair-do’s from different decades. We are discussing all of the possibilities. 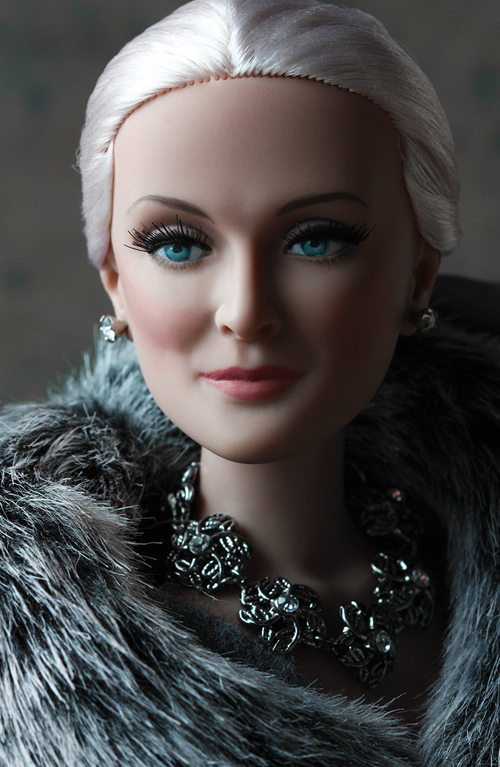 For more about the Carmen Dell’Orefice doll!